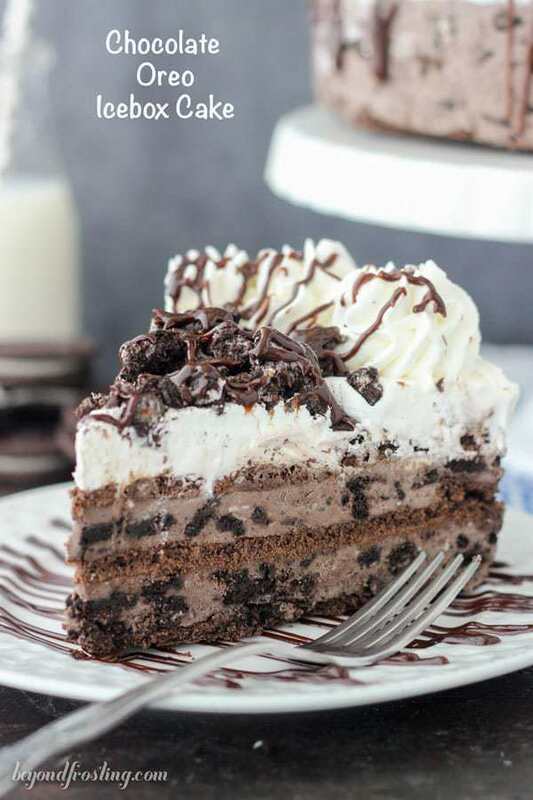 If you love chocolate, you’ll love this Chocolate Oreo Icebox Cake. The layers are built with chocolate graham crackers, a chocolate Oreo mousse, whipped cream and plenty of Oreos and fudge on top! Am I the last person on earth to see the Harry Potter movies? The past couple weeks I finally gave into my boyfriend’s request and we started watching the series. I have to say I’m not sure why I waited so long. They are so good and I can see why everyone is so obsessed. Plus have you SEEN all the desserts those kids feast on? How can I get an invite to that?? It was really difficult for me to decide when to share this recipe with you. Of course no-bake recipes are popular in the summer, but this week seemed like the perfect time. I’ve got some big announcements coming later this week and it’s all about no-bake desserts. Hint hint. 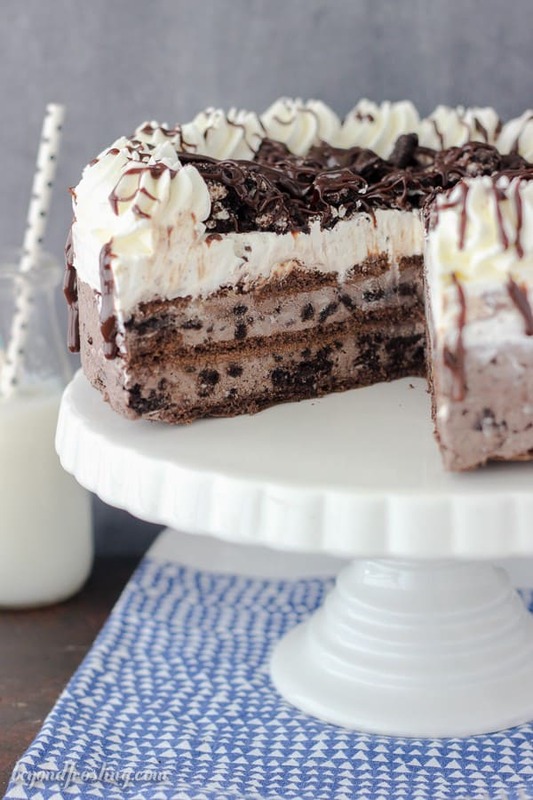 People fought over the last slice of this Oreo Overload Icebox Cake and here’s why. 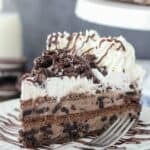 The layers are built with chocolate graham crackers, a chocolate Oreo mousse, whipped cream and plenty of Oreos and fudge on top. There is seriously SO many Oreos in here. It’s the least I could do for you. This is also a boyfriend-approved dessert. You guys know his requirement: chocolate, Oreos, plain Rice Krispie Treats or Snickerdoodles. So when I showed him the final product and asked him if he wanted to try it, he was all over it. 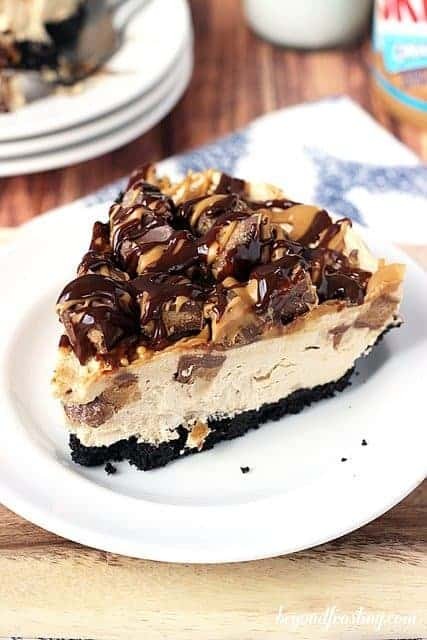 I started off by freezing this dessert (which also means you can prepare this in advance), but when it came time to serve, I took it out of the freezer and let it thaw in the refrigerator. 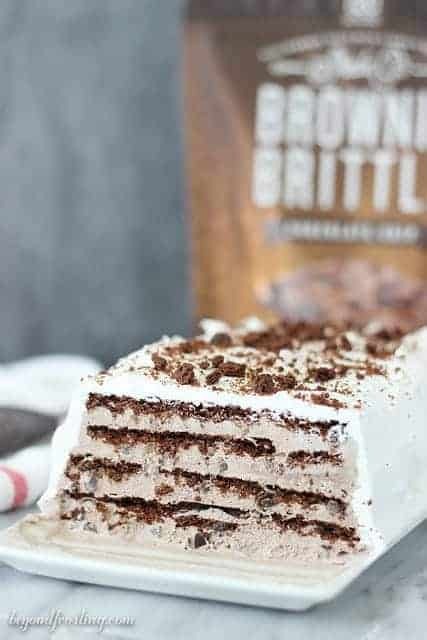 This icebox cake is great when it’s frozen, but with all the layers, it a lot to cut through. Since its frozen, the graham crackers do stay crispy. So it’s all about preferences here. If you decide to go straight to the refrigerator with this dessert, you also can’t go wrong. The graham crackers and the Oreos get super soft and the mouse is very light and airy. It almost reminds me of those Oreo dirt cups that everyone raves about. I used my trusted springform pan to build this dessert. Seriously, I don’t know what I would do without it. The springform pan allows you to remove the edges of the pan leaving you with a beautiful layered dessert inside. To build the layers, you’ll play a little Tetris and align the graham crackers on the bottom of the pan, don’t be afraid to cut the crackers to fit. Once you add the mousse, it binds everything together. I prefer to put some parchment paper on the bottom of my pan. This helps to prevent the graham crackers from sticking. Another helpful tool is my angled spatula, because I can easily spread the mousse from edge to edge. I prefer to add the toppings right before serving. 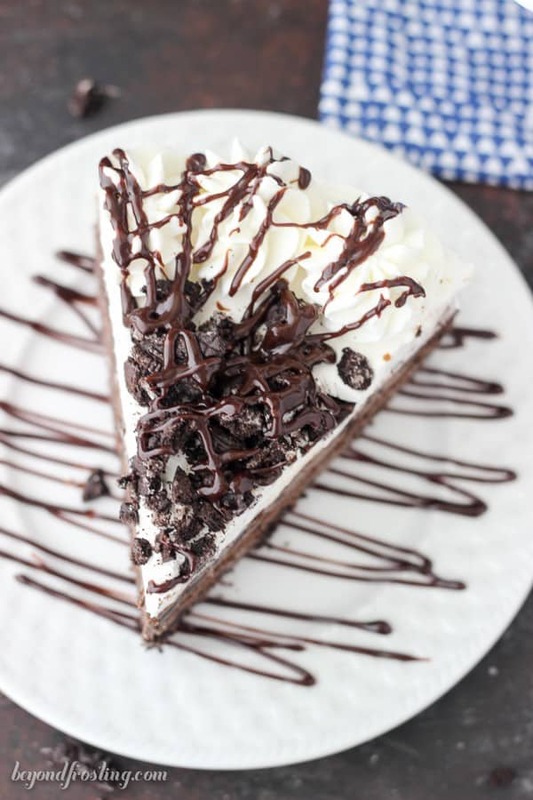 I want the Oreos on top to be a little bit crunchy. It’s up to you if you want to use Cool Whip or whipped cream. I use both in my kitchen but I want to make sure you have the option. Now that you have all the tools to get this done, I challenge you to get in the kitchen and make it happen. Allow the cream cheese to soften at room temperature for about 30 minutes or soften in the microwave. To soften in the microwave, remove the wrapper and place the cream cheese on a plate. Microwave for 15 to 20 seconds. Using an electric mixer, beat the cream cheese for 2 to 3 minutes until it is completely smooth. Add ¼ cup of the heavy whipping cream and beat it into cream cheese until cream cheese resembles a liquid mixture. Then add all the remaining heavy whipping cream and vanilla extract and beat on medium-high speed. Once the cream starts to thicken, slowly add the powdered sugar and cocoa powder and beat until soft peaks form. Place the Oreos in a large Ziploc bag and use a rolling pin or another heavy object to crushed the Oreos. Add the crushed Oreos to the chocolate mousse, folding until they are well incorporated. Line the bottom of a 9-inch springform pan with parchment paper. I prefer to hand it out of the edges and close the pan around it, but you can cut a 9-inch circle to fit as well. Align the chocolate graham crackers in the bottom of the pan. It is okay to cut the crackers to fit as needed, but the more large/whole pieces you have, the better structure they will provide. 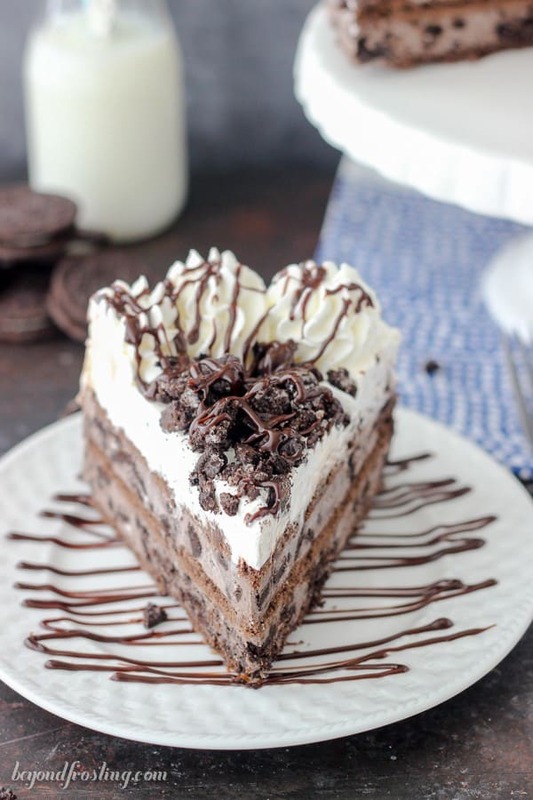 Divide the chocolate Oreo mousse in half. Spread half of the mousse over the bottom layer of graham crackers. It helps if you hold the graham crackers in place with your fingers if they are sliding around. Next, add a second layer of graham crackers and spread the remaining mousse.Finally, add the third and final layer of the graham crackers. Put your mixing bowl and whisk in the freezer for 15 minutes until it is completely cold. Whip the heavy cream on medium high speed for several minutes until it’s starts to thicken . Slowly add the powdered sugar and continue beating on medium high until stiff peaks form. Measure out about 1 1/2 cups of the prepared whipped cream to pipe the borders. Spread the remaining whipped cream over top of the cake. Use a large star tip to pipe the border. Cover this with aluminum foil and freeze for 2 to 4 hours. OR you can choose to keep this in the refrigerator, but allow at least 4 hours for the graham crackers to soften. 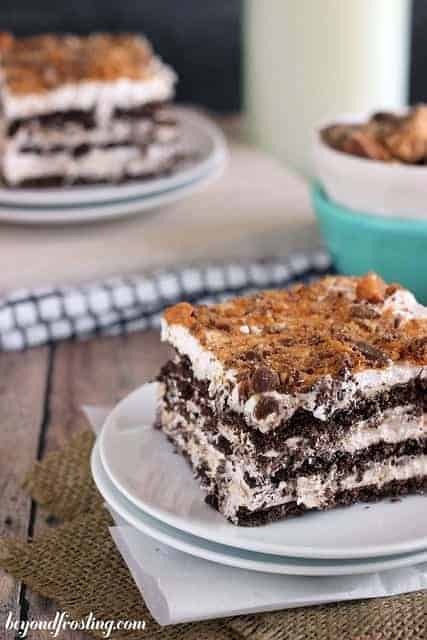 Prior to serving, remove the icebox cake from the freezer and allow it to thaw for 20 minutes. 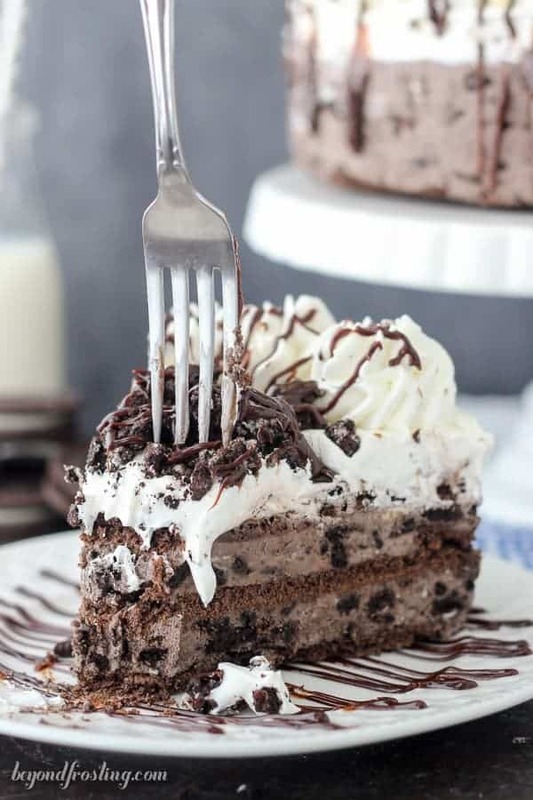 Crush 6 Oreos and sprinkle over top of the cake. 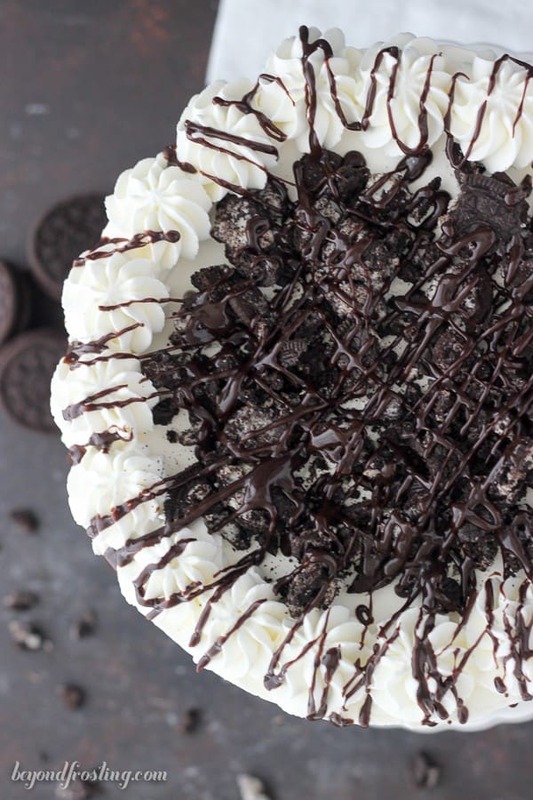 Drizzle warm Hot Fudge sauce over the Oreos. This was great! I made it for my Oreo-loving son’s birthday and he LOVED it! I was a little daunted with trying to get the graham cracker right with not wanting it to be too hard/ crunchy and complete mush, but some how it came out perfect. I love how the recipe was easy to make, even for this less-experienced cook. Even better, it made the perfect amount of whipped cream topping and made some extra which helped account for my frosting goofs and redo! Thanks! for the topping, isn’t it too much sugar for the whipping cream. for a whipped cream, I had in mind 1 cup of whipping cream for 1 tablespoon of icing sugar. here it’s 1 cup and 3/4 whipping cream for 1 cup and 1/4 of powdered sugar. Hi there, I actually always make my whipped cream 50% powdered sugar to the liquid. So for 1 cup of heavy cream I use 1.2 cup powdered sugar. This isn’t every time, but most of the time. This ensures a nice stuff whipped cream, however it is much sweeter than if you make it without the powdered sugar. Somehow I missed this post. Holy Moses!!! It is stunning to look at and contains everything I LOVE!!! I will have to find a reason to make this!!! It for sure is a crowd pleaser!! 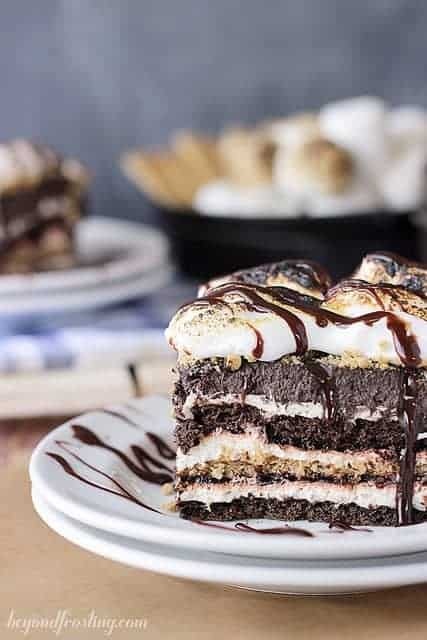 You make such gorgeous desserts, I’m kind of glad we’re not neighbors (in the nicest way possible, because I’d likley be at your doorstep every day)! 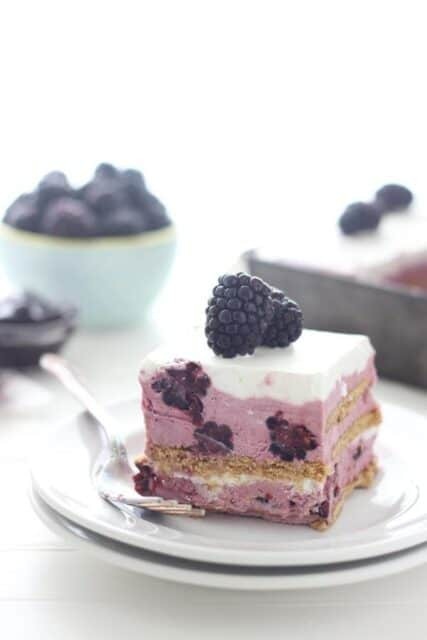 Ice box cakes are amazing and I’ve made a bunch of them, but none quite this pretty!! Woah I think I actually saw my name written into that cake! This looks sensational!!! Pinned. LOL!! So did I friend, so did I.
I hope you try it Joanne!! This looks like chocolate heaven! My guys are going to love it! Thanks Joanne! It sure is and you could use any type of Oreos! You can’t have too much chocolate! Looks great!